Weathered Shell Sample tapestry shows a lovely collection of seashells on display. Here we see nine distinctly different sea shells on a beach. The forms and intricacies in each shell is wonderfully rendered here, to show the variety of structured in these shells and clams. The use of color and light is gorgeous as we dmire the golden and beige tones of the shells and sand. 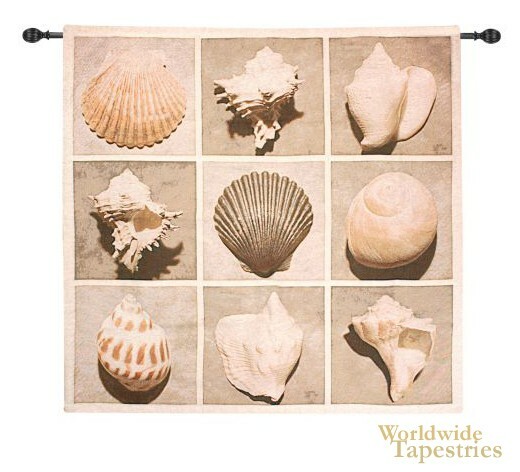 Weathered Shell Sample tapestry is backed with lining and tunnel for easy hanging. Note: tapestry rod, where pictured, is not included in the price. Dimensions: W 50" x H 50"